Village View Post: Happy Thanksgivukkah To All! 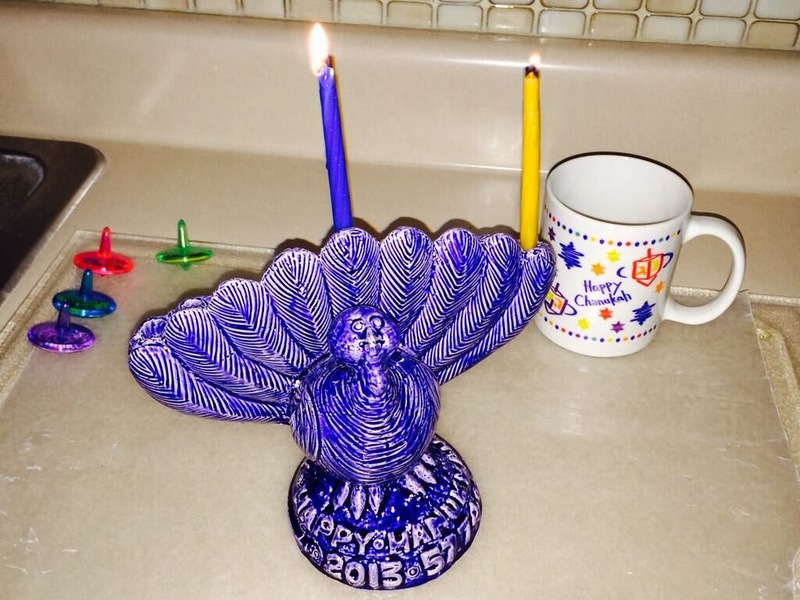 And the Menurkey is lit for the first night of Hanukkah!! Wow, it has been 125 years since Thanksgiving fell on the first day of Hanukkah, a rare occasion!! And everywhere you look around the web and on social networks people are excited; so excited are they that a new word has been born, "Thanksgivukkah"! The secular calendar and the Jewish calendar collided this year and we now have a once-in-a-life time convergence; something that will not happen again for another 70,000 years. The reason for this year's rare alignment has to do with quirks of two calendars, the Gregorian and Jewish calendars. Much of the world follows the Gregorian calendar, which has a 365-day year based on the Earth's orbit around the sun, with leap years every four years. The Gregorian calendar was implemented by Pope Gregory to keep Easter in line with the season it was originally celebrated in. But the Jewish calendar, which was created more than 2,000 years ago, follows the waxing and waning of the moon. That calendar has 12 months of roughly 30 days each, which works out to a bit more than 354 days in a year. As a result, the Jewish year creeps earlier and earlier relative to the Gregorian calendar. But many Jewish holidays, such as Passover, are tied to seasons such as spring. To keep holidays in line with their seasons, the Jewish calendar includes an entire extra month in seven of every 19 years. This year is a leap year, so Hanukkah and all of the other Jewish holidays came especially early in 2013. And Thanksgiving, which falls on the fourth Thursday in November, happened to come extra late this year, allowing for the convergence. This Hanukkah and Thanksgiving I am thankful for family, health, prosperity, food, technology, friends and music. As we all gather around our tables with our loved ones, I would like to wish each of you a Happy Hanukkah and a joyous Thanksgiving! The generations who struggled and sacrificed to preserve their memory. Given so long a legacy to celebrate in so sublime a land. And declare the miracles – of our tradition, our freedom and our future. And merit the joy of handing it on to generations.